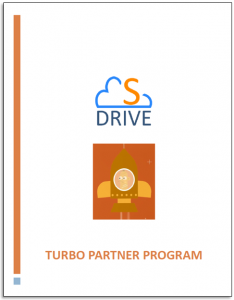 We developed Turbo Partner Program to help you grow your business through a closer relationship with S-Drive. Our partners gain access to resources, tools, and information on all S-Drive products, so, together, we can provide your customers with solutions to transform their business. Already a Turbo Program Partner? Still Considering if This is the Right Program for You? Elevate the conversation – become a trusted advisor to customers by showing your understanding of sales processes and business outcomes. S-Drive’s applications help solve mission-critical business challenges. Increase revenue – by adding AppExchange ISV applications into a customer Salesforce environment, you unlock the opportunity to gain a minimum of 5% of the revenue that will be paid every month. Technical Expertise – by demonstrating technical expertise in S-Drive products through S-Drive’s certification process, you can show your customers and prospects your competitive advantage. Insure your customers’ success – referring S-Drive solutions reduce your risk. S-Drive is an established brand with a 5 star customer success team and reputation in the Salesforce ecosystem.